Check out the featured announcements on the King Avenue Digest, then click on the links to read more. The rest of the Digest has more comprehensive happenings organized by ministry/category announcements that pertain to you. You can also download the Carillon and Calendar to get the full picture! UMCOR Sunday allows The United Methodist Church to respond when disaster strikes. Think of UMCOR as our “Go Team” who can be present when help is needed. Unlike other benevolent causes, UMCOR receives no funds from the regular United Methodist Church budget. 100 percent of all other donations go toward specific relief projects. 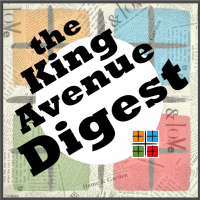 Visit kingave.org to see the entire King Avenue Digest for this week.